6th Grade - Quarter 4 - Ms. Mckenna's art room! WELCOME TO THE 6TH GRADE QUARTER 4 PAGE! Quarter 4 art has begun! 5/6/16: A productive week in art! 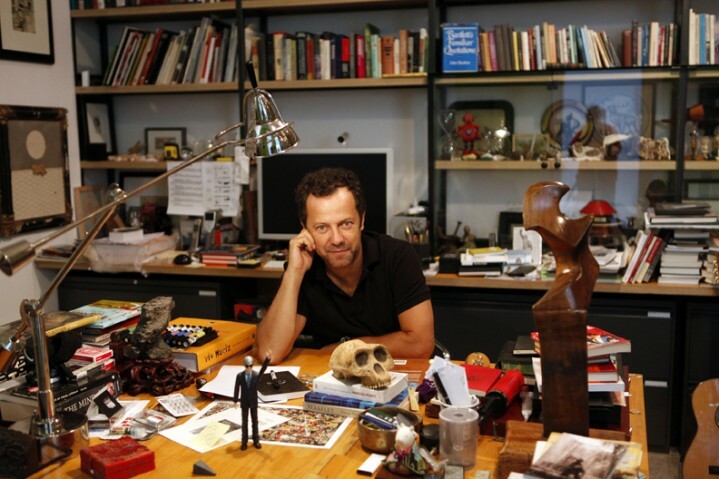 6th Graders have begun their first project - creating their own mini assemblage murals inspired by artist Vik Muniz! They have just learned about Vik Muniz, a world renowned Brazilian artist and photographer. They watched clips from Wasteland, a documentary capturing the life of Vik Muniz as he travels to Brazil to visit the country's largest landfill. It is here that he will meet a group of very special people that will become the subjects of his artwork. He learns about the "pickers" as they are called, people who work at the landfill, sifting through all of the garbage to separate all of the recyclable products in order to make a living, support themselves and their families. After meeting them, he begins taking photographs of them and then uses the garbage to assemble large-scale portraits of the pickers. The assemblage portraits are then photographed and turned into extremely moving portraits to honor these people and all that they do. 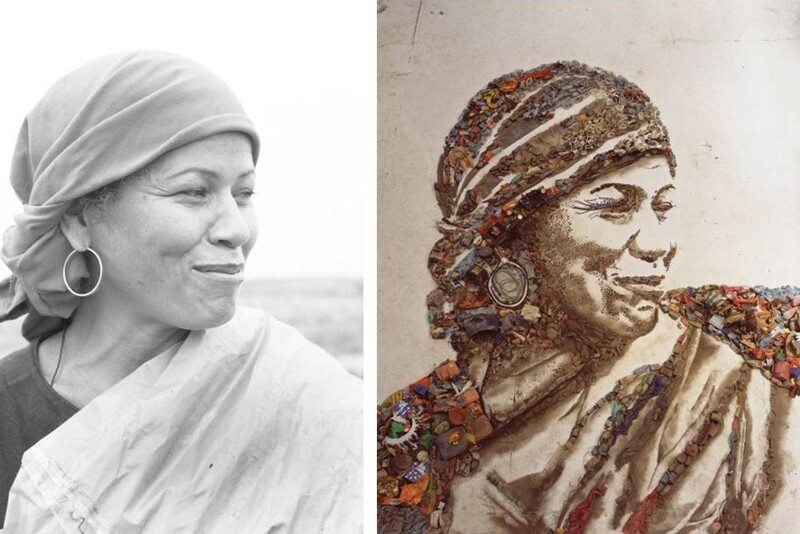 On the left is a photograph of one of the pickers from Gramacho (landfill) taken by Vik Muniz for this project. The photo of the right is a piece of the end result of a project. The photograph on the left was projected onto the floor of a warehouse in which the pickers and Vik together assembled the garbage on top of the projection on the floor to create the portrait. The assembled portrait was then photographed from up high in the warehouse and the photograph then became the artwork. The artwork was then sold at an auction in London and the money was given to the pickers. Participating in Vik's project allowed these people to create new lives for themselves - thus Vik achieving his goal of doing an art project to change a group of people's lives. 6th graders are now being challenged to take on Vik's process and create their own mini assemblage murals while also finishing one large scale assemblage mural together as a class. 6th graders chose photos to work from, they were given a choice to either re-draw their photo and then assemble pieces on top of their drawings or just assemblage pieces directly on top of their printed photo, similar to how Vik Muniz works with his projections. Check out a few images of students at work as well as a photo of our Lady Gaga large scale assemblage mural that quarter 4 art students will be helping to finish!! 6th graders have been busy working on their individual value study collages. Check out some in progress pictures of their work! 5/16/16: Some more progress on our value collages and getting to know our new project! 6th grade students are still hard at work on their value collages...we have one finished and the rest are still trucking along, making some amazing pieces!! Check out some in progress photos and one final collage photo! Then keep reading to hear about our new project we will be starting! OUR NEW PROJECT: Students will have up until this friday (mid-term...cant even believe it!) to work on their value collages, after that, if they aren't done, they can come after school to work on them. Once they are finished, they will begin working on their movable beast / invention project. We also looked at our classroom pinterest page for inspiration...check that out here to see the kinds of things we are expecting. A big goal for this project is to get students to start seeing everyday objects and everyday things in their life differently. We want them to see life as an artist...when they see a plastic cup on the side of the road that someone littered...rather than thinking of it as trash, they begin to use their imagination to see what that plastic cup COULD be...a torso for a robot, a hat for a creature...etc. Stay tuned to see what your students create!